Every day is a different and a new day in Praia do Espelho. The coast line design lives in constant transition due to the presence of coral reefs and the tidal movements. Espelho is a site of untouched nature surrounded by rainforest; a unique destination. 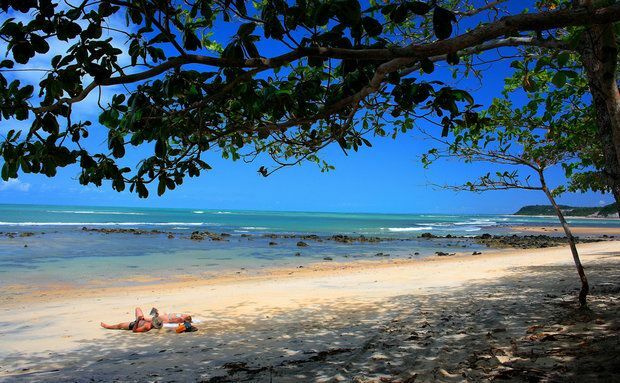 Located about 17km from the center of Trancoso, Praia do Espelho gives us amazing and unique landscapes. With its clear and translucent waters, the Praia do Espelho, which means “mirror” in English, could not have another name. The sea is calm and shallow, which gives visitors the pleasure of observing the rich marine life. From the top of the cliffs or in the lawns by the sea, it’s possible to watch the changes of nature; that’s also a perfect place to rest on top of lounge chairs and cushions, a local habit. Voted to be one of the best beaches in the country, Espelho is a Unit of Marine Conservation. Nothing else could be as fair as this title for this unique destination in southern Bahian coast. Check the houses available for renting in Espelho. Check the houses available for selling in Espelho.